Google have released the latest version of their wonderful modelling application. 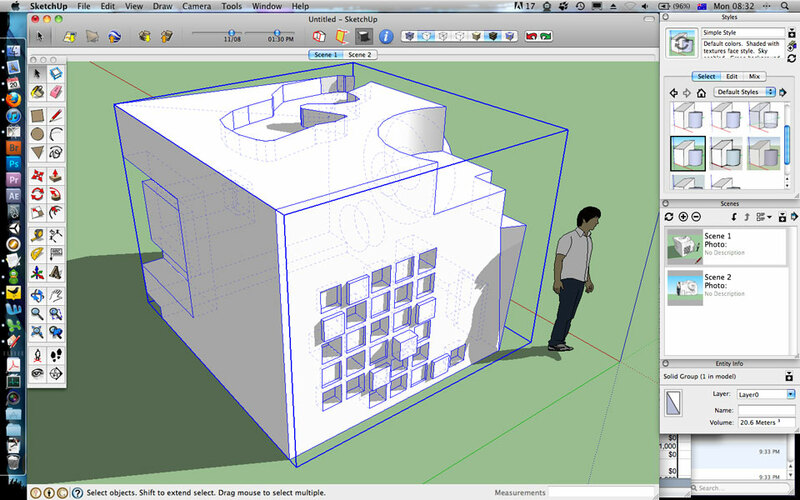 SketchUp 8 brings a modest set of enhancements by 3d software standards, but keeps well to its logic, which is an intuitive and simple beast. I have had a play with the free version already, Pro adds some more goodies as well. The interface is essentially the same, we do get a few little bits like dotted hidden lines, scene thumbnails and volume calculations – this quick thing I made is a cool 20.6 metres cubed. The Building Maker for adding 3D geometry to aerial photos linked to Google Earth and now SketchUpis very cool. While Sydney isnt one of the cities live yet, Melbourne is and I had a little go at a warehouse. I am not sure how much detail is important yet, or how to handle the variation from photo to photo. Regardless it is an exciting prospect for a 3D Sydney model to come.